KIEV, November 29. /TASS/. Ukraine’s Central Election Commission has decided to cancel the elections of local councils’ members and city mayors in ten regions of the country where martial law had been imposed, the Ukrinform news agency reported on Thursday. "On November 29, the Central Election Commission decided to terminate the election process in the united territorial communities in ten regions where martial law had been imposed," the report said. The election commission earlier reported that the local elections would be held on December 23. Martial law was imposed in Ukraine for a period of 30 days from November 28 in the Vinnitsa, Lugansk, Nikolayev, Odessa, Sumy, Kharkov, Chernigov, Donetsk, Zaporozhye and Kherson Regions, as well as in Ukraine’s territorial waters in the Sea of Azov. 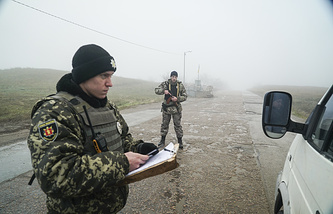 The pretext for the decision to declare martial law was the recent border violation clash in the Kerch Strait on November 25, when three Ukrainian naval ships breached the current rules of passage from the Black Sea to the Sea of Azov. The intruding Ukrainian vessels illegally crossed the Russian state border, trespassed into Russian territorial waters and conducted dangerous maneuvers. In defiance of repeated warnings and demands to stop, the Ukrainian ships kept violating the law by continuing their risky maneuvers, which drove the Russian forces to use gunfire in order to compel them to stop. As a result, all three ships were detained. In addition, three Ukrainians injured in the incident were given medical assistance. A criminal case was opened over the violation of the Russian state border. Moscow described the incident as a provocation.